What if young children who had never held a paint brush were suddenly given an opportunity to express themselves in full color? Lila Magallón, owner of La Encantada Galería / Cava in La Paz, conceived the idea to bring art to kids in rural villages with difficult access in Baja California Sur. She dubbed her initiative “Acercarte.” The name comes from The Spanish “acerca” (to bring closer to) and “arte” (art). Acercarte’s first project was painting a mural with children from El Cardonal, a rural village on the East Cape of Baja California Sur. Luis Enrique Lucero Meza (logistic coordinator at El Cardonal for Acercarte), signed up 26 children, ages 5 to 16, from the the towns of El Cardonal, Boca del Alamo, Las Tinas and San Bartolo. Lila, 40, and fellow La Paz artist Leonardo Diaz held a weeklong workshop where children produced a 24-panel mural entitled “Guardianes del Desierto,” (Guardians of the Desert). 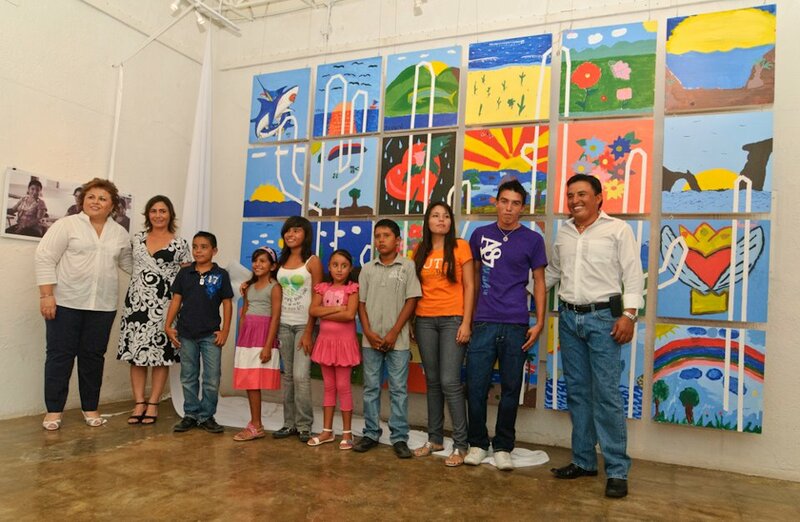 La Encantada held an opening on October 15 displaying the complete mural; Municipal President Esthela Ponce Beltran attended the unveiling. The mural will be on display through early November at La Encantada in the old historic center of La Paz at Belisario Domínguez 1245, between 5 de Mayo and Callejón Constitución. Acercarte’s funding comes completely from private donations. They are looking for sponsors for future projects and other locations to display the “Guardianes del Desierto” mural.